Relaxed Muscle is a group formed in 2002 by Jarvis Cocker and Jason Buckle, with Jarvis performing under the pseudonym Darren Spooner. Richard Hawley, who provided extra guitar for the group, assumed the name Wayne Marsden, which was the name of a boy who bullied Jarvis as a child. The group began shortly after Pulp’s hiatus, with Jarvis – who had previously worked with Jason in The All Seeing I - wanting to create music that was removed from the record industry and his own fame. The concept of the group was that they were a small band from Doncaster, unknown to the wider public. They were touted as “The Sound of Young Doncaster” and their first release, The Heavy EP, was released with their identities remaining secret. In May of 2003 the group performed live under the name Relaxed Muscle for the first time at Bethnal Green Working Men’s Club whilst filming the music video for their song “Sexualized”. 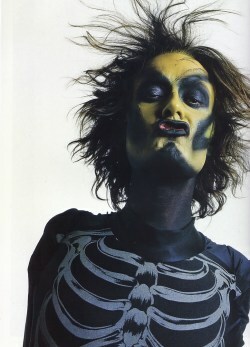 Jarvis wore a skeleton costume and full face paint in an attempt to disguise himself. He was recognized regardless and photographs from the performance later appeared in The Sun, revealing Jarvis and Jason’s true identities. Despite their cover being blown, Jarvis continued to assume the persona of Darren in live performances and in interviews. An entire backstory was created for the character of Darren which Jarvis would strictly adhere to. Darren’s roots can be traced back to the making of Pulp’s “Mis-Shapes” music video in 1995. 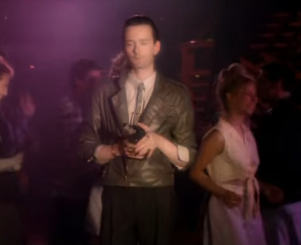 Jarvis plays a townie in the video, and “drank about three quarters of a bottle of brandy” in order to get into character. His rude persona was dubbed Darren Spooner, and Jarvis began using the name when checking into hotels on tour. The Darren Spooner of Relaxed Muscle is said to have lived in Doncaster his entire life, having a rough childhood and later gang involvement. Darren sang for many years in the band Heavy Cochran, which played cover versions in working men’s clubs in and around Doncaster, until the band ended in the 90s. Darren’s life spiraled quickly out of control as he took up heavy drinking, and found new work “doing long-distance lorry driving”. This put a strain on his marriage causing it to break down irreparably, and Darren had to resort to thievery in order to survive. He was then arrested and made to do community service planting flowers in a Doncaster park. It was there that Darren met Jason – a young man on a Restart scheme – and the two formed Relaxed Muscle. In a 2003 interview, Darren was stated as being 44 years old (born in the year of the dog). His wife’s name is Mary, and he has two children – both drug addicts – one of whom is a son, also named Darren. Jarvis has described Darren as “an anti-superhero, a super nasty hero”, and the character served an outlet for his darker side after marrying and having his son. Darren is an avid karate fan, claiming that it turned his life around, and would often break sugar glass bottles over his head and karate-chop balsa wood whilst on stage. In interviews, Jarvis used a voice-changer to make his voice deeper – which was then attributed to the many years of smoking throughout Darren’s lifetime. The face-makeup also was said to hide a disfigurement which Darren sustained whilst cleaning out a silo with harsh chemicals – wearing no protective gear Darren suffered severe burns to his hands and face. 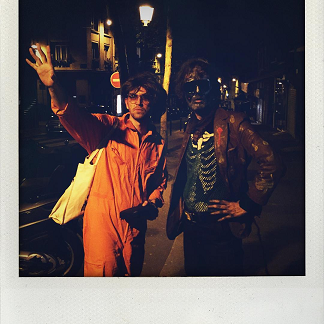 While A Heavy Nite With... was the group’s only album, and Jarvis has denied the likelihood of new music, Relaxed Muscle occasionally make appearances to DJ and perform - as recent as October, 2016.